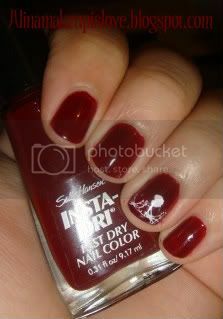 Nail Of The Day: Sally Hansen Insta-Dri In "Cinna-Snap"! Well loves, the weekend is over...boo! And it is the beginning of a new week. Here is to making this week a great one (raises glass). To start of my week, I decided I was feeling a little "fall-ish". I wanted something that screams Hey! Autumn is here! And I decided to paint my nails with Sally Hansen's Insta-Dri polish in #18 Cinna-Snap ($4.99 at CVS). This polish color is sort of a deep reddish brown. It's the Perfect color for a fall mani. I used 2 coats for each nail. Have any of you tried Sally Hansen's Insta-Dri polishes? Love em? Hate em? Let me know in the comments section! Disclosure: I bought this nail polish on my own at my local CVS drugstore. I have tried the sally hansen insta-dri nail polish with some horrible base coat and it made my nails bubble up so bad, so ima try the nail polish again but with a better base coat but i do love the consistancy and quick drying of it! I am tempted to try this color! is it soo pretty :) thanks for posting!